Tuberculosis occurs more frequently in some situations than in others; it is common, for example, in lymph glands, in bones and joints, in the peritoneum, the intestine, the kidney, prostate and testis, and in the skin and subcutaneous cellular tissue; it is seldom met with in the breast or in muscles, and it rarely affects the ovary, the pancreas, the parotid, or the thyreoid. Tubercle bacilli vary widely in their virulence, and they are more tenacious of life than the common pyogenic bacteria. In a dry state, for example, they can retain their vitality for months; and they can also survive immersion in water for prolonged periods. They resist the action of the products of putrefaction for a considerable time, and are not destroyed by digestive processes in the stomach and intestine. They may be killed in a few minutes by boiling, or by exposure to steam under pressure, or by immersion for less than a minute in 1 in 20 carbolic lotion. Methods of Infection.—In marked contrast to what obtains in the infective diseases that have already been described, tuberculosis rarely results from the infection of a wound. In exceptional instances, however, this does occur, and in illustration of the fact may be cited the case of a servant who cut her finger with a broken spittoon containing the sputum of her consumptive master; the wound subsequently showed evidence of tuberculous infection, which ultimately spread up along the lymph vessels of the arm. Pathologists, too, whose hands, before the days of rubber gloves, were frequently exposed to the contact of tuberculous tissues and pus, were liable to suffer from a form of tuberculosis of the skin of the finger, known as anatomical tubercle. Slight wounds of the feet in children who go about barefoot in towns sometimes become infected with tubercle. Operation wounds made with instruments contaminated with tuberculous material have also been known to become infected. It is highly probable that the common form of tuberculosis of the skin known as “lupus” arises by direct infection from without. Fig. 33.—Tubercle Bacilli in caseous material × 1000 diam. Z. Neilsen stain. In the vast majority of cases the tubercle bacillus gains entrance to the body by way of the mucous surfaces, the organisms being either inhaled or swallowed; those inhaled are mostly derived from the human subject, those swallowed, from cattle. Bacilli, whether inhaled or swallowed, are especially apt to lodge about the pharynx and pass to the pharyngeal lymphoid tissue and tonsils, and by way of the lymph vessels to the glands. The glands most frequently infected in this way are the cervical glands, and those within the cavity of the chest—particularly the bronchial glands at the root of the lung. From these, infection extends at any later period in life to the bones, joints, and internal organs. There is reason to believe that the organisms may lie in a dormant condition for an indefinite period in these glands, and only become active long afterwards, when some depression of the patient's health produces conditions which favour their growth. When the organisms become active in this way, the tuberculous tissue undergoes softening and disintegration, and the infective material, by bursting into an adjacent vein, may enter the blood-stream, in which it is carried to distant parts of the body. In this way a general tuberculosis may be set up, or localised foci of tuberculosis may develop in the tissues in which the organisms lodge. Many tuberculous patients are to be regarded as possessing in their bronchial glands, or elsewhere, an internal store of bacilli, to which the disease for which advice is sought owes its origin, and from which similar outbreaks of tuberculosis may originate in the future. The alimentary mucous membrane, especially that of the lower ileum and cæcum, is exposed to infection by swallowed sputum and by food materials, such as milk, containing tubercle bacilli. The organisms may lodge in the mucous membrane and cause tuberculous ulceration, or they may be carried through the wall of the bowel into the lacteals, along which they pass to the mesenteric glands where they become arrested and give rise to tuberculous disease. Relationship of Tuberculosis to Trauma.—Any tissue whose vitality has been lowered by injury or disease furnishes a favourable nidus for the lodgment and growth of tubercle bacilli. The injury or disease, however, is to be looked upon as determining the localisation of the tuberculous lesion rather than as an essential factor in its causation. In a person, for example, in whose blood tubercle bacilli are circulating and reaching every tissue and organ of the body, the occurrence of tuberculous disease in a particular part may be determined by the depression of the tissues resulting from an injury of that part. There can be no doubt that excessive movement and jarring of a limb aggravates tuberculous disease of a joint; also that an injury may light up a focus that has been long quiescent, but we do not agree with those—Da Costa, for example—who maintain that injury may be a determining cause of tuberculosis. The question is not one of mere academic interest, but one that may raise important issues in the law courts. Human and Bovine Tuberculosis.—The frequency of the bovine bacillus in the abdominal and in the glandular and osseous tuberculous lesions of children would appear to justify the conclusion that the disease is transmissible from the ox to the human subject, and that the milk of tuberculous cows is probably a common vehicle of transmission. Changes in the Tissues following upon the successful Lodgment of Tubercle Bacilli.—The action of the bacilli on the tissues results in the formation of granulation tissue comprising characteristic tissue elements and with a marked tendency to undergo caseation. The recognition of the characteristic elements, with or without caseation, is usually sufficient evidence of the tuberculous nature of any portion of tissue examined for diagnostic purposes. 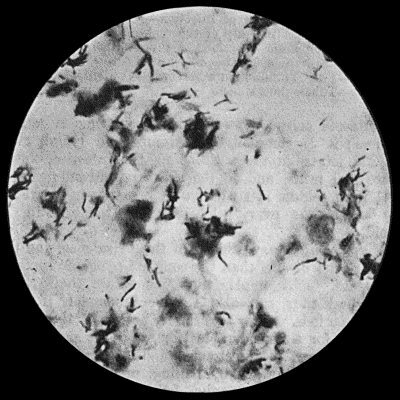 The recognition of the bacillus itself by appropriate methods of staining makes the diagnosis a certainty; but as it is by no means easy to identify the organism in many forms of surgical tuberculosis, it may be necessary to have recourse to experimental inoculation of susceptible animals such as guinea-pigs. The changes subsequent to the formation of tuberculous granulation tissue are liable to many variations. It must always be borne in mind that although the bacilli have effected a lodgment and have inaugurated disease, the relation between them and the tissues remains one of mutual antagonism; which of them is to gain and keep the upper hand in the conflict depends on their relative powers of resistance. If the tissues prevail, there ensues a process of repair. In the immediate vicinity of the area of infection young connective tissue, and later, fibrous tissue, is formed. This may replace the tuberculous tissue and bring about repair—a fibrous cicatrix remaining to mark the scene of the previous contest. Scars of this nature are frequently discovered at the apex of the lung after death in persons who have at one time suffered from pulmonary phthisis. Under other circumstances, the tuberculous tissue that has undergone caseation, or even calcification, is only encapsulated by the new fibrous tissue, like a foreign body. Although this may be regarded as a victory for the tissues, the cure, if such it may be called, is not necessarily a permanent one, for at any subsequent period, if the part affected is disturbed by injury or through some other influence, the encapsulated tubercle may again become active and get the upper hand of the tissues, and there results a relapse or recrudescence of the disease. This tendency to relapse after apparent cure is a notable feature of tuberculous disease as it is met with in the spine, or in the hip-joint, and it necessitates a prolonged course of treatment to give the best chance of a lasting cure. If, however, at the inauguration of the tuberculous disease the bacilli prevail, the infection tends to spread into the tissues surrounding those originally infected, and more and more tuberculous granulation tissue is formed. Finally the tuberculous tissue breaks down and liquefies, resulting in the formation of a cold abscess. In their struggle with the tissues, tubercle bacilli receive considerable support and assistance from any pyogenic organisms that may be present. A tuberculous infection may exhibit its aggressive qualities in a more serious manner by sending off detachments of bacilli, which are carried by the lymphatics to the nearest glands, or by the blood-stream to more distant, and it may be to all, parts of the body. When the infection is thus generalised, the condition is called general tuberculosis. Considering the extraordinary frequency of localised forms of surgical tuberculosis, general dissemination of the disease is rare. The clinical features of surgical tuberculosis will be described with the individual tissues and organs, as they vary widely according to the situation of the lesion. The general treatment consists in combating the adverse influences that have been mentioned as increasing the liability to tuberculous infection. Within recent years the value of the “open-air” treatment has been widely recognised. An open-air life, even in the centre of a city, may be followed by marked improvement, especially in the hospital class of patient, whose home surroundings tend to favour the progress of the disease. The purer air of places away from centres of population is still better; and, according to the idiosyncrasies of the individual patient, mountain air or that of the sea coast may be preferred. In view of the possible discomforts and gastric disturbance which may attend a sea-voyage, this should be recommended to patients suffering from tuberculous lesions with more caution than has hitherto been exercised. The diet must be a liberal one, and should include those articles which are at the same time easily digested and nourishing, especially proteids and fats; milk obtained from a reliable source and underdone butcher-meat are among the best. When the ordinary nourishment taken is insufficient, it may be supplemented by such articles as malt extract, stout, and cod-liver oil. The last is specially beneficial in patients who do not take enough fat in other forms. It is noteworthy that many tuberculous patients show an aversion to fat. For the use of tuberculin in diagnosis and for the vaccine treatment of tuberculosis the reader is referred to text-books on medicine. In addition to increasing the resisting power of the patient, it is important to enable the fluids of the body, so altered, to come into contact with the tuberculous focus. One of the obstacles to this is that the focus is often surrounded by tissues or fluids which have been almost entirely deprived of bactericidal substances. In the case of caseated glands in the neck, for example, it is obvious that the removal of this inert material is necessary before the tissues can be irrigated with fluids of high bactericidal value. Again, in tuberculous ascites the abdominal cavity is filled with a fluid practically devoid of anti-bacterial substances, so that the bacilli are able to thrive and work their will on the tissues. When the stagnant fluid is got rid of by laparotomy, the parts are immediately douched with lymph charged with protective substances, the bactericidal power of which may be many times that of the fluid displaced. It is probable that the beneficial influence of counter-irritants, such as blisters, and exposure to the Finsen light and other forms of rays, is to be attributed in part to the increased flow of blood to the infected tissues. Artificial Hyperæmia.—As has been explained, the induction of hyperæmia by the method devised by Bier, constitutes one of our most efficient means of combating bacterial infection. The treatment of tuberculosis on this plan has been proved by experience to be a valuable addition to our therapeutic measures, and the simplicity of its application has led to its being widely adopted in practice. It results in an increase in the reactive changes around the tuberculous focus, an increase in the immigration of leucocytes, and infiltration with the lymphocytes. The constricting bandage should be applied at some distance above the seat of infection; for instance, in disease of the wrist, it is put on above the elbow, and it must not cause pain either where it is applied or in the diseased part. The bandage is only applied for a few hours each day, either two hours at a time or twice a day for one hour, and, while it is on, all dressings are removed save a piece of sterile gauze over any wound or sinus that may be present. The process of cure takes a long time—nine or even twelve months in the case of a severe joint affection. In cases in which a constricting bandage is inapplicable, for example, in cold abscesses, tuberculous glands or tendon sheaths, Klapp's suction bell is employed. The cup is applied for five minutes at a time and then taken off for three minutes, and this is repeated over a period of about three-quarters of an hour. The pus is allowed to escape by a small incision, and no packing or drain should be introduced. It has been found that tuberculous lesions tend to undergo cure when the infected tissues are exposed to the rays of the sun—heliotherapy—therefore whenever practicable this therapeutic measure should be had recourse to. Since the introduction of the methods of treatment described above, and especially by their employment at an early stage in the disease, the number of cases of tuberculosis requiring operative interference has greatly diminished. There are still circumstances, however, in which an operation is required; for example, in disease of the lymph glands for the removal of inert masses of caseous material, in disease of bone for the removal of sequestra, or in disease of joints to improve the function of the limb. It is to be understood, however, that operative treatment must always be preceded by and combined with other therapeutic measures.